The home theater market continues to grow as more smart home products become available and affordable for today’s consumers. With the new year approaching swiftly, let’s take a look at the trends in home sound and theater that will keep thriving straight through 2018 and beyond. There are many smart home products available today, but you can’t experience the true magic until they all work together seamlessly. Whether it’s a handheld remote for your videos, a touch-screen to browse and play music, or a keypad to manage lights, shades, and audio, products like Control4 home automation offer many interfaces and voice prompts that allow you to interact with your home however you prefer. A rise in technological advancements has transformed how we experience music and movies—especially in the realm of wireless audio. Consumers are choosing to alleviate strain caused by buffering, missed beats, and freezing, with sleek and powerful wireless access points are placed around the home. More than 49 million Wi-Fi-connected homes in the U.S. are driving the binge-watching craze, making streaming content a crucial component of the latest home theater systems. Share your entire movie library, streaming video and satellite channels in every room—with no need for set-top boxes and multiple video sources. Voice control will continue to be embraced, with 50 percent of all searches expected to be conducted via voice by 2020. Advancements in home sound and voice will play an integral role in the adoption of even more smart home products. As products like Control4 home automation make things easier in the real world, virtual reality (VR) and wearable technology are finding their way into our homes. Manufacturers will continue developing and refining smart and networked home-theater speakers that support VR. If you dream of having more smart home products, make it a reality. 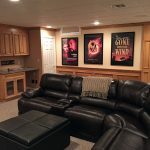 Many of the latest home theater systems can be had on any budget.